Happy Monday my friends! We spent our weekend at the cabin. With our trip to Europe, it had been a month since we were there. The grass was knee high and you could not see my flowers through all of the weeds. We spent the Sunday doing yardwork while the kids played. The hardwork paid off and my yard is back to beautiful. Sunday night I set out to create a card for the #GDP040 Global Design Project Challenge this week. Shawn De Oliveira is a tallented stamper. I was reading his Bio, when I was writing this post, and I was surprised to discover that he has been stampin' for three years and a Stampin' Up! demonstrator for just over a year! Can you believe that? Gosh, when I was three years into my Stampin' hobby I was a hot mess! Thankfully that stage is behind me ... hopfully my card today is anything but a hot mess. 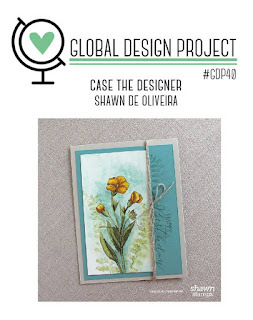 Click on over to the Global Design Project to see what the rest of the GDP design team has created today. You can stamp and play along too this week. Full details are over at GDP.